Yet since they have no jobs other than Marwood’s rare audition here and there and spend most of their time letting the dishes and filth accumulate in their London flat while throwing back anything they can get their hands on from pot to speed to lighter fluid to buzz them out of their minds, you wouldn’t imagine that they’d actually need to leave the city in order to let loose. However, a journey to the country is precisely what was needed to jolt not only the characters out of their repetitive funk but writer/director Bruce Robinson’s feature filmmaking debut as well. With one foot in Who’s Afraid of Virginia Woolf? style stagey tragedy and another in Hair flavored comedy, the film which was based on Robinson’s unpublished semi-autobiographical novel, rebounds from a slightly disconcerting and admittedly rambling opening sequence that offered us a surrealistic mod speed freak send up of Ken Kesey, William S. Burroughs and Hunter S. Thompson. And although Robinson’s work touches everything from Quadrophenia to Hair to Easy Rider etc. it soon morphs into its own trippy concoction of the type of pastoral comedy that no doubt both Withnail and Marwood would love to appear, especially considering the fact that Robinson even manages to work in one of Shakespeare’s best Hamlet monologues at the end of the movie. Having finagled the keys to a cottage belonging to Withnail's flamboyantly gay, eccentric uncle Monty (Richard Griffiths), the two slacker thespians spend what little money they have between them fixing up the Jaguar to make their great escape. Arriving in the dead of night and in the pouring rain, instead of the country retreat of which they were dreaming, the ill-equipped Withnail and Marwood unfortunately find themselves in an equally ill-equipped shack. Scared out of their wits by the uninvited Monty whom — having taken a shine to Marwood — tries his best to seduce the straight and visibly frightened young man in one of those hilarious bed-switching evenings of British farce worthy of the stage, Withnail & I recovers from its rocky start to become one of Britain's most revered and oft-quoted cult classics. 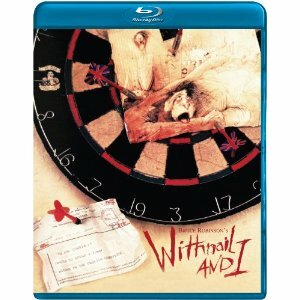 Due to its modest roots as a relatively independent UK venture produced by former Beatles star George Harrison's company HandMade Films, Withnail's dully lit scenes and poor production values ensure that the work isn't much improved in high definition. Yet the inauspicious technical aspects are quickly forgotten in this Image Entertainment released Blu-ray thanks to the blisteringly funny performances from its three leads, especially the irreplaceable Grant whose career was launched by his turn as the self-destructive yet amazingly talented Withnail based upon Robinson's dead-before-his-time former roommate. It's constantly reinventing and far more entertaining than you might expect given its tonally awkward opening act. Moreover, this landmark import that's set in the transitional post-hippie pre-punk period of youthful rebellion proves that as long as our unlikely heroes embark on a trip that's worth taking, it doesn't matter how much they trip in the process since Robinson never fails to rise above easy stoner humor from start to finish. Text ©2010, Film Intuition, LLC; All Rights Reserved. http://www.filmintuition.com Unauthorized Reproduction or Publication Elsewhere is Strictly Prohibited and in violation of the Digital Millennium Copyright Act.FTC Disclosure: Per standard professional practice, I received a review copy of this title in order to evaluate it for my readers, which had no impact whatsoever on whether or not it received a favorable or unfavorable critique.